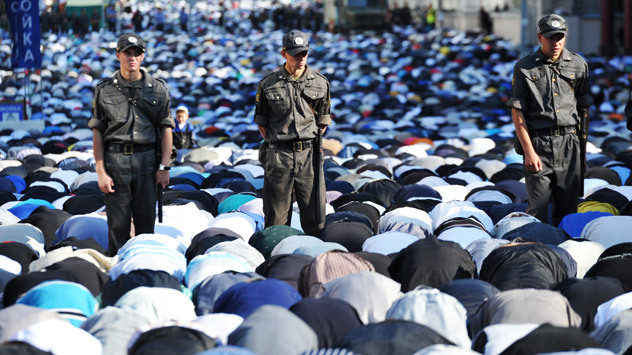 Moscow does not have a sufficient number of mosques for its Muslim population, but a recent rally against the construction of a new mosque in a Moscow suburb demonstrates that increasing their number will be hard to do. About 2 million Muslims live in Moscow, but the lack of mosques causes them to look for new places to pray, said Rushan Abbyasov, Imam of the Moscow Conciliar Mosque, in an interview withe Novye Izvestia on Sept. 24. Yet Moscow’s Urban Development and Land Commission has decided not to build a mosque in Mitino, after residents of the suburb gathered at a rally to protest the plans. Residents were concerned that the new Mosque would cause disturbances in the area during Muslim festivals. Last Wednesday evening, approximately 1,500 residents of the Mitino district northwest of Moscow took to the streets, chanting “Say no to the mosque in Mitino.” The day before the rally took place, organizers created a page on the Russian social network VKontakte, where “all who cared” were invited to gather near Pyatnitskoe Highway and express their discontent. Law enforcement was on the scene to keep tabs on the situation; but organizers only collected signatures from people who were likewise against the mosque being built in the region. “We are collecting signature sheets that will support our cause at a meeting of local Duma deputies, which is set to take place in October,” said the chairman of the district's municipal assembly, Igor Kononov. Despite the peaceful nature of the rally, four protesters were detained. The press service of the Ministry of Internal Affairs Department for Moscow stated that the detainees were held liable for their actions under Article 20 (2) of the Code of Administrative Offences, which regards violations of regulations for organizing protests and rallies. The four detained protesters were released after administration procedures were taken, but they are scheduled to appear before a court to settle the amount of their fines. Residents and protestors in Mitino were primarily concerned that the Islamic center would attract thousands of worshippers during religious festivals, causing huge traffic jams and other epidemic disturbances in the area. Plans to build the mosque had been revealed in early September, when Moscow’s Urban Development and Land commission approved plans to build the Islamic United Center on a plot of land nearly 38,000 square feet in size. Representatives of the Muslim community continue to insist that the need for a mosque in Mitino is dictated by religious principles. In August of this year, the Russian Muftis Council proposed that a mosque be built in every region of Moscow. Ravil Gaynutdin, a representative from the organization, believes that a devout Muslim should pray five times a day. Therefore, all Muslims require a mosque within walking distance of their homes. Albir Krganov, a mufti for Moscow and Russia's central regions, insists that Muslim spiritual leaders are asking for one mosque, albeit a big one. It is generally accepted that there are only four mosques in Moscow, in addition to a Shi'ite mosque at the Iranian embassy. According to the web portal Mosques of Russia, there are seven mosques in Moscow, excluding the city's many unofficial prayer houses. According to various sources, and despite a relatively small number of mosques in the city, Moscow is home to about two million Muslims.